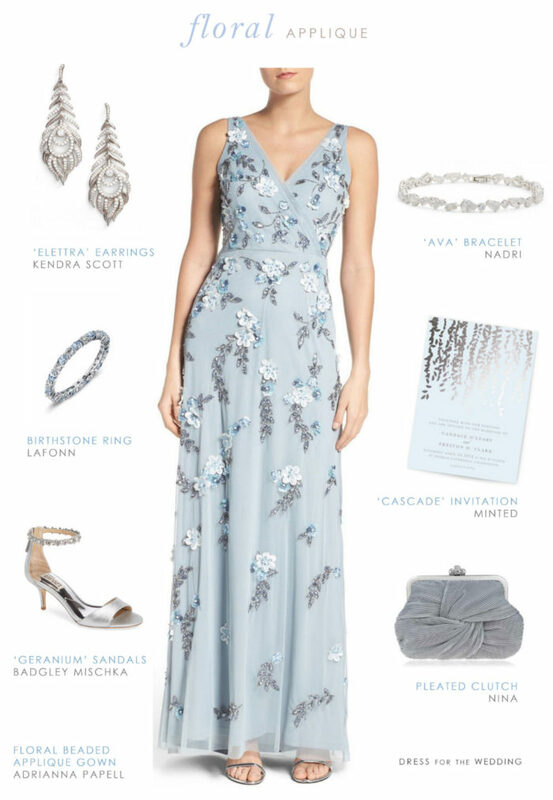 This wedding outfit post featuring a blue beaded floral applique gown for a formal wedding, a mother of the bride gown, or bridesmaid uses affiliate links in shopping sources in images and where noted in italics. It’s no secret that floral gowns are always hot for spring, but if there were to be a new aspect to this trend it would be that there are more dimensional florals like the beautiful beaded appliques on this dress. In fact, it’s such a beautiful look, our favorite harbinger of style, Catherine, the Duchess of Cambridge, recently wore a gown of this style at an event in Paris! This pale blue evening gown is an ideal look for a formal spring or summer wedding, and would be a perfect selection for a mother of the groom or mother of the bride. It’s also a lovely bridesmaid dress; especially as a unique choice in a line up of pale blue mix-and-match bridesmaid dresses. 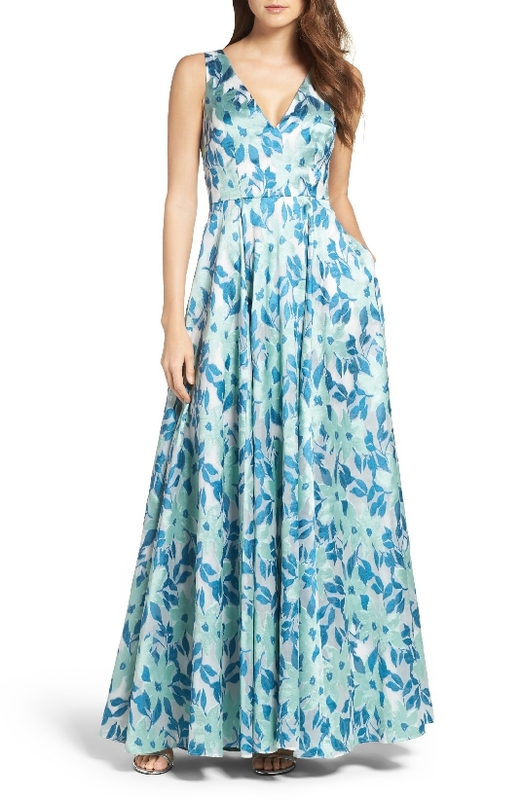 Here’s another blue floral ballgown I love for spring weddings, also by Adrianna Papell. If you’re still on your search for a pretty blue formal gown, you might also want to check out the curated collection of light blue dresses for mothers of the bride, pale blue bridesmaid dresses, and our pale blue dresses for wedding guests. Looking for a dress in a darker hue? Shop wedding guest dresses by color, or try these floral mother of the bride dresses, or navy blue mother of the bride dresses, our just check out all the mother-of-the-bride dresses we’ve picked out for this season’s weddings. The selected blue evening gowns in the Shop the Look section are affiliate links from our sponsoring shops which help support this wedding attire website.